Screenshots from SEPTA Transit Watch app. SEPTA is officially crowdsourcing vigilance from riders throughout the Philadelphia area. Announced Wednesday morning, the new SEPTA Transit Watch app provides the public with a quick, discreet method to report suspicious activity directly to police. The app, available for Apple and Android devices, was conceived through a partnership with emergency communications software firm ELERTS. Within 20 seconds, riders who encounter security or safety issues can notify SEPTA Transit Police with a text message or photo sent through the app's "Report a Problem" button. Two-way communication enables transit police to interact anonymously with riders and determine the GPS coordinates of the reported issue. Users can also open the app to directly call transit police and report an emergency. SEPTA has experienced a rash of both fights and suicides in recent years, incidents that could potentially be anticipated if riders in the area observe behavior that either appears troubling or has already become a safety issue. 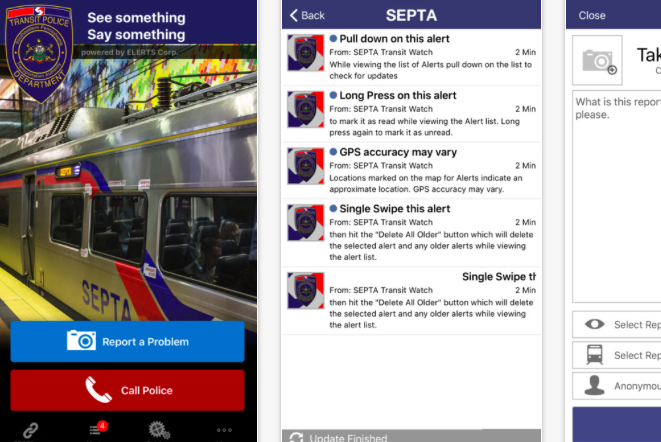 The app also allows SEPTA to communicate with riders using "Be on the Lookout" messages, which may concern missing persons or criminal suspects. “SEPTA Transit Watch opens up an exciting new channel of communication with our riders,” SEPTA Police Chief Thomas Nestel III said. “We expect it will provide invaluable real-time information that will enhance safety and security throughout the transit system."